We would like to thank everyone for their kindness and support in 2018. It has been with a heavy heart that we learn more each day of the horrifying facts surrounding Human Trafficking and its effects on not only the individual being trafficked but that persons entire family and their community. Our greatest wish is that one day we will talk about slavery in the 21st Century as something of the past. But until then, we continue our pledge to do all that we can to help educate others to the facts of Human Trafficking and to reduce the number of victims. We will also continue to support efforts to bring victims into a life of survivorship and success, and we hope that you will join us in this endeavor. We wish each of you a truly happy, safe, and healthy 2019. July 17, 2018, marked the opening of the Hue Jackson Survivors Residence at the Salvation Army Harbor Light Complex, which is now fully operating and occupied by survivors. Shortly afterward, the Cleveland Brown's training camp offered an opportunity for a new season, new supporters, and new friends. Paul Moss of Cleveland, OH graciously donated to spend the day with "Coach Hue Jackson and the Browns" at the training center in Berea, OH and attended a pre-season game with one of his favorite people, his daughter. Since then, Paul has become a friend of the foundation and has continued his support in a variety of ways. One of the first regular games of the season, Pete Thales of the greater Cincinnati area joined us as well. He too has become a notable supporter of the foundation and has also pledged his continuous support on a variety of levels. Back to school brought about numerous opportunities to educate students about the dangers and realities of human trafficking. The Hue Jackson Foundation worked closely with students from Laurel, Beaumont, and Hathaway Brown to prepare an interactive break-out session for the National Coalition of Girls Schools Symposium held on October 1, 2018. This well-attended breakout session led to great conversations and programs at respective schools as well as another local program. The students of Laurel School have been working with the foundation in training for and scripting a full-length, live stage performance depicting the life of a survivor of Human Trafficking, which will be presented in the Spring of 2019. 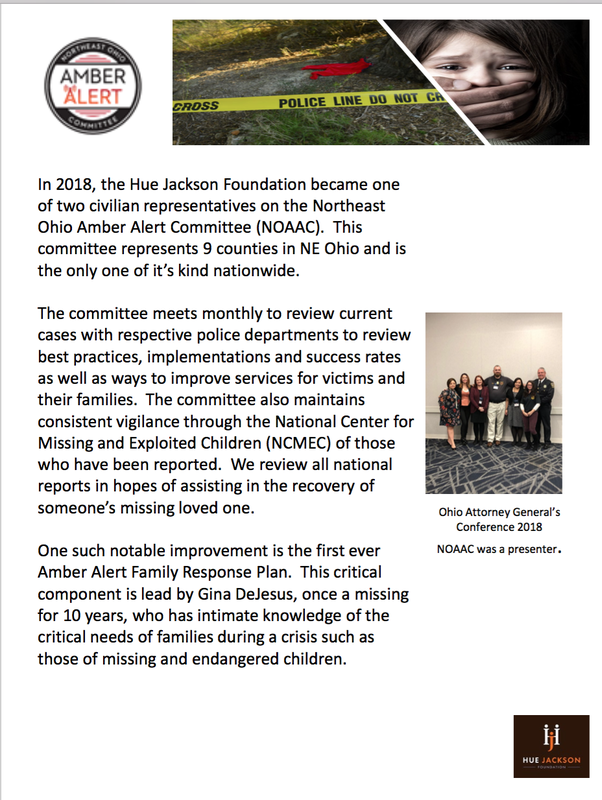 Also, during the second half of 2018, The Foundation became an active civilian member of the Amber Alert Committee of Northeast Ohio representing nine counties. As part of those on-going duties, the committee participated in the Ohio Attorney General’s Conference in Columbus, OH as presenters. We are also pleased to announce that one of our Amber Alert Committee Members, Gina DeJesus, recently opened the Center for Missing, Abducted and Exploited Children and Adults, where Kimberly Diemert, Executive Director of the Hue Jackson Foundation is an active member of the Board. The Center provides guidance, assistance and support for family members, loved ones and friends of victims. We are very proud of the accomplishments of our Special Advisor, John Morgan, who was honored at the Salvation Army's Civic Luncheon in September when he received the "Others" award for his outstanding work and dedication to fighting Human Trafficking along with Karen Walsh of the Coalition to End Human Trafficking, also an award recipient. The foundation has been active throughout the community at various speaking engagements, from businesses such as Meritec in Painesville, OH to the A21 Walk which took place in 500 different locations throughout the world in October. The foundation also hosted dignitaries from Oman when they visited the United States to learn how we educate others about the atrocities of human trafficking and how we work with local, state and federal governments, as well as nonprofit organizations in eradicating human trafficking while providing much-needed service to victims and survivors. We continue to exchange ideas and information to combat human trafficking around the globe. 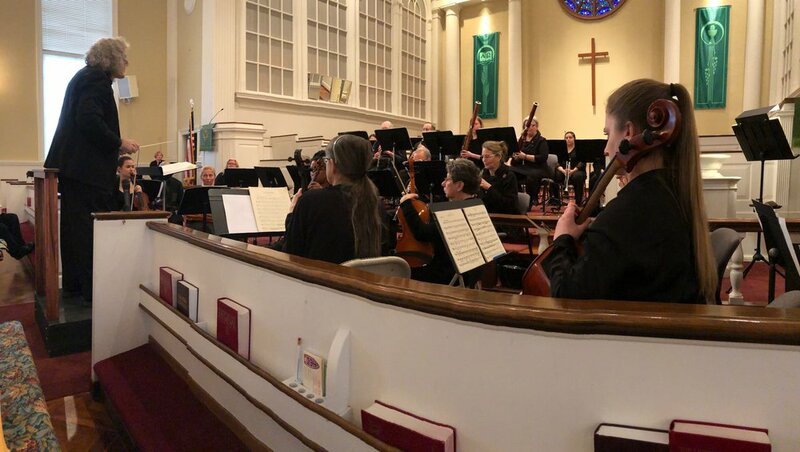 The holiday season kicked off with a benefit concert hosted by the North Coast Sinfonietta under the direction of Mark Perlman, Conductor. 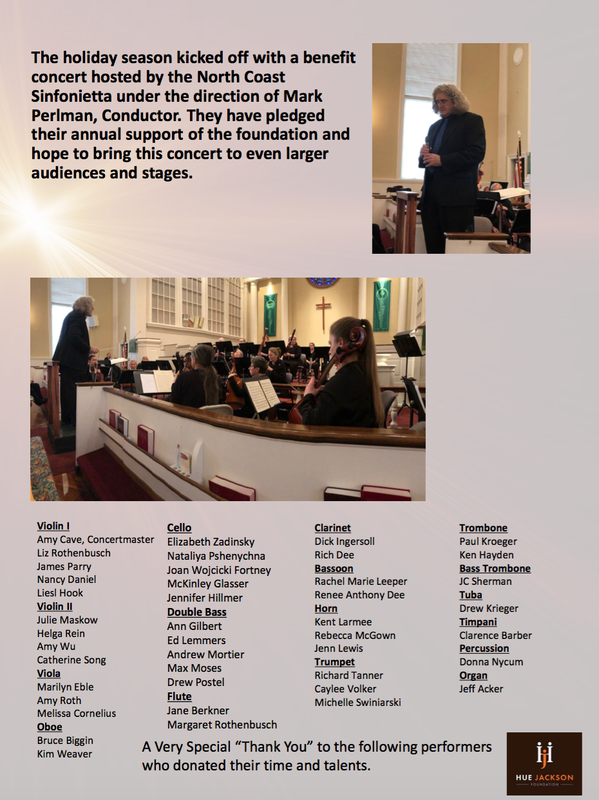 They have pledged their annual support of the foundation and hope to bring this concert to even larger audiences and stages. The Cleveland Institute of Art, School of Architecture and Design has also been working with the foundation and has taken on the mission to design various "Survivors Residences" for both the adult and minor population who have become victims of human trafficking. They hope that they will be able to use their designs in communities most affected by human trafficking. As part of the goals to help connect those with the greatest needs to those who have the greatest ability to fulfill those needs, the Hue Jackson Foundation has developed a software application that is web-based. This software application will be distributed free of charge to ALL nonprofit organizations in early 2019, thanks to the support and generosity of iFuse Solutions in Cleveland, Ohio. 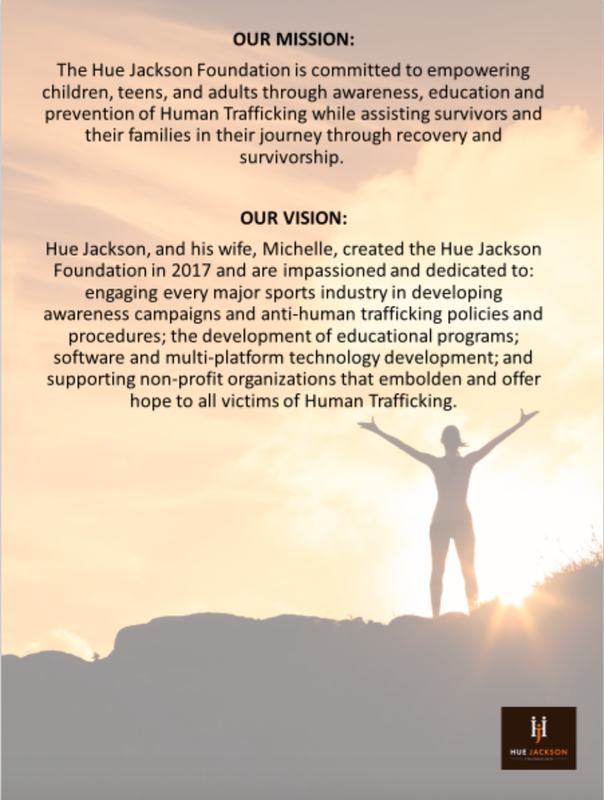 These are just a sample of the many projects and programs that the Hue Jackson Foundation has undertaken in 2018. We look forward to 2019 and working with all of our supporters as we strive to eradicate slavery and reduce the suffering of those who have become victimized. 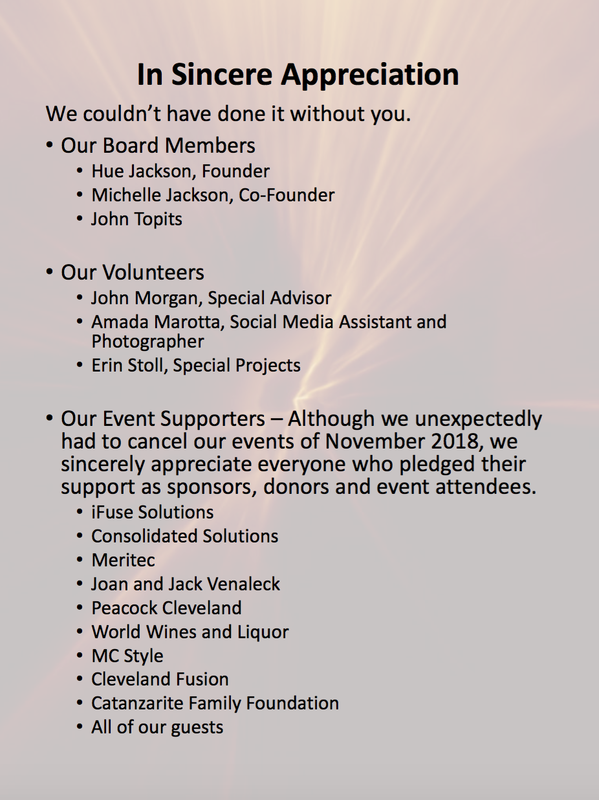 We could not do this without the generosity of our supporters and dedicated volunteers. To each of them, a heartfelt "THANK YOU!" The Hue Jackson Foundation has partnered with the Salvation Army of Greater Cleveland to help fund much-needed safe housing for adult female Human Trafficking victims. The Hue Jackson Survivors of Human Trafficking Residence will offer a safe environment for victims to heal and focus on their treatment. It will include shared office space for law enforcement, healthcare and social service professionals who work with them. In addition to these agencies, the Renee Jones Empowerment Center will utilize this office. The foundation believes that in order for survivors to break the trafficking cycle, secure housing is critical. On Tuesday, July 17th the new Hue Jackson Foundation Survivors of Human Trafficking Residence on the 3rd floor of the Harbor Light Complex opened. This residence is approximately 4,500 sq. ft. and provides a safe environment for up to 12 recovered adult survivors of human trafficking. It offers collaborative and holistic services, and provides shared office space for law enforcement, healthcare, and social services providers, to help assist these survivors on their road to recovery. Ohio is currently ranked 4thin the nation for the number of reported cases of human trafficking. Most people think it only happens in third-world countries or in America’s largest cities, but it’s happening right here in Northeast Ohio and in a big way. Tragically, one of the largest groups that are being targeted are children between the ages are 12 to 14. 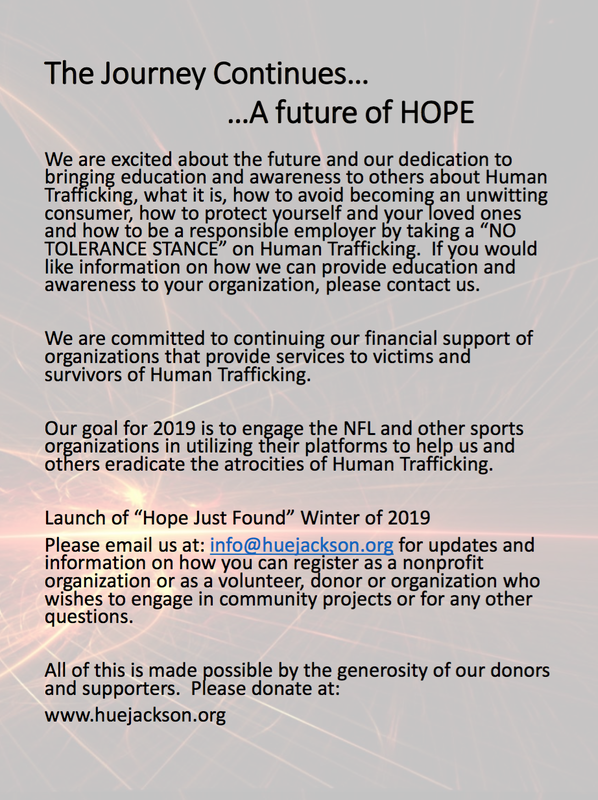 This effort, to aid in the recovery of human trafficking victims, is the result of a partnership in mission between The Salvation Army and the Hue Jackson Foundation.